I was out surveying a site for badgers earlier this week and tried to catch a photo of all of the flowering plants I could see as I went along. These are all iPhone photographs so do excuse any deficiencies in quality! These were all recorded along arable margins or roadside verges which demonstrates the importance of these less-managed areas within the landscape to allow these species to continue to flourish. Judging by the number of butterflies and bumblebees which were soaring or buzzing as I walked around, there were plenty of pollinators grateful for these early flowering species. Cowslip – Primula veris, is a native member of the primrose family which is familiar to many as garden plants. Notice the little orange streaks within the yellow flowers. If you get your nose close to the ground and sniff the flowers, you can pick up the scent of apricots from the flowers. Dandelion – Taraxacum officinalis is a member of the daisy family and is one of the few species which are probably known by the majority of the population, even if only as a weed to be decimated upon sight. It is in fact a beautiful species if you look a little closer, and a very important as an abundant and early source of nectar for early spring species such as queen bumblebees which emerge and must feed before establishing their new nests. 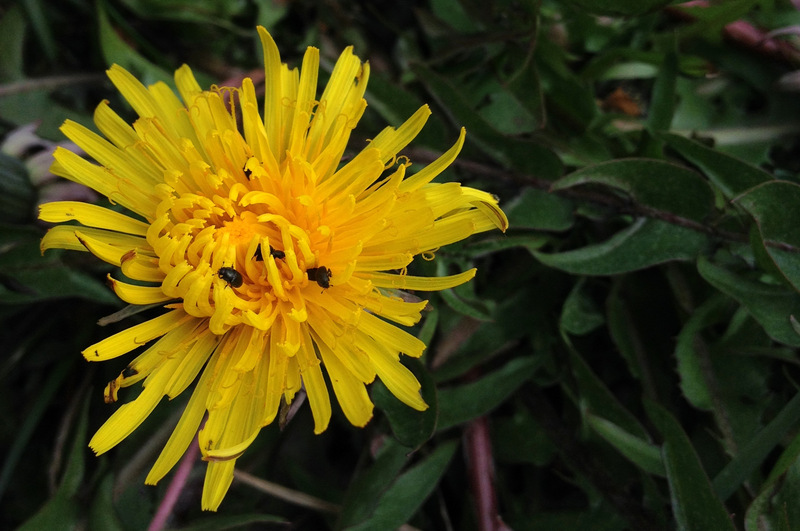 The dandelion is actually a clonal species and the correct latin name should finish with the suffix agg. because they are an aggregate of clones which do not reproduce sexually. Experts can allegedly distinguish between these clones to identify the particular variety of a dandelion. 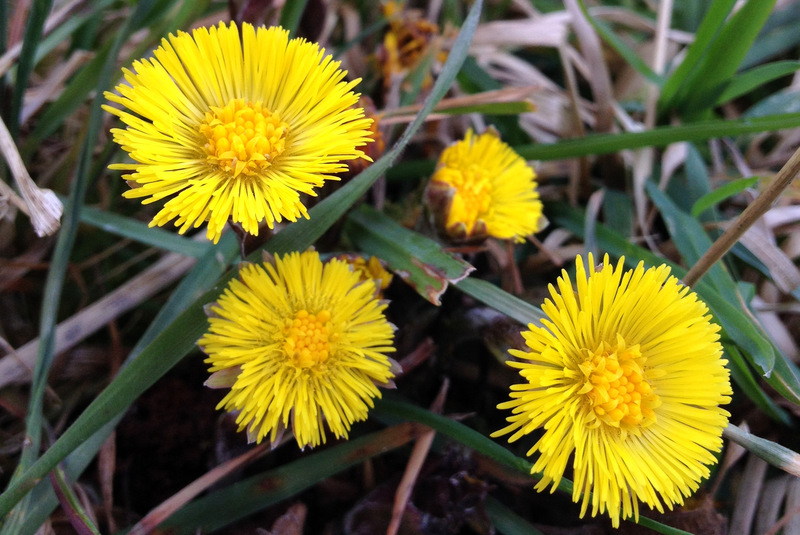 Colt’s-foot – Tussilago farfara is another member of the daisy family but is quite distinct from the dandelion. The flowers emerge long before the leaves, with scaly flower stems rising from the bare earth with bright yellow flowers above them. The leaves, large broad kidney-shaped leaves emerging later into the year. 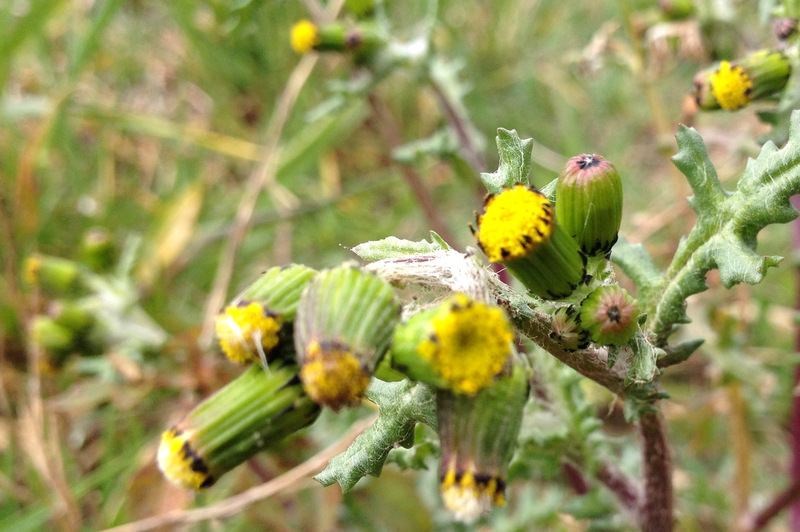 Groundsel – Senecio vulgaris is yet another yellow member of the daisy family. It is an annual species which is frequently identified as a weed in gardens and arable fields. The flowers look as though they are not yet fully opened but they are in fact mature in this image – the flower lacks florets which usually fan out and form a feathered effect around a flower. Imagine taking the colt’s-foot flower in the image above and strip away the feathery florets around the edge and you would end up with a very similar looking flower. Lesser celandine – Ranunculus ficaria is a member of the buttercup family and has the distinctive shiny yellow flowers. It should be correctly named as the lesser celandine as there is also a greater celandine, although the two are not related with the latter a member of the poppy family and quite different in appearance. 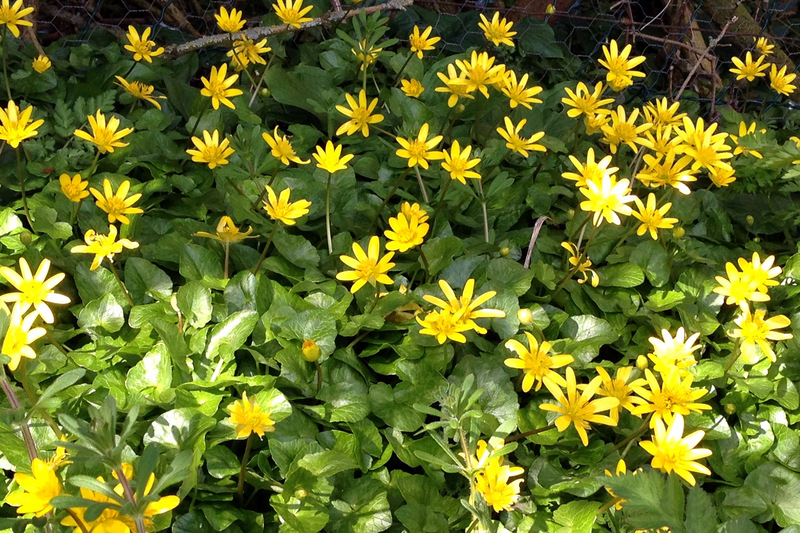 The celandine is a distinctive spring species whose flowers upon in response to the sunlight and close up at night. 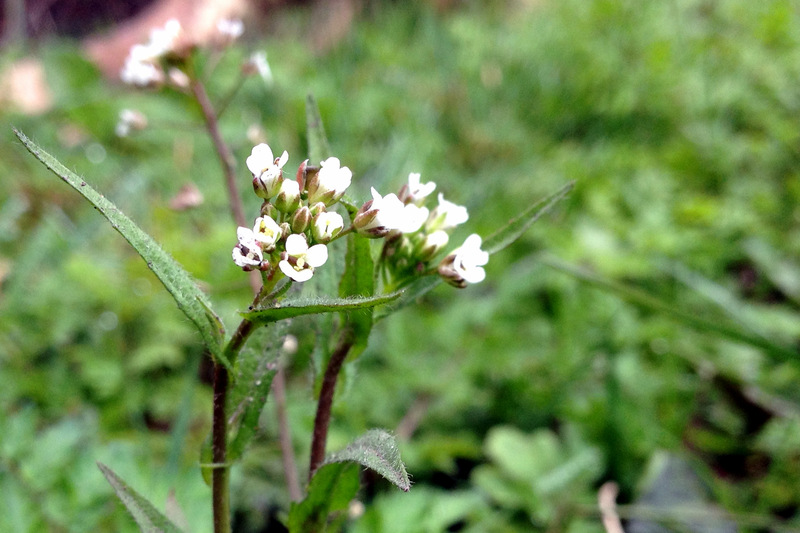 Shepherd’s purse – Capsella bursa-pastoris is a fairly inconspicuous member of the cabbage family with rather small white flowers. It becomes much more recognisable when the seed pods emerge which are heart shaped and give the flower it’s common and latin name. The species name is bursa-pastoris which translates as purse-shepherd. 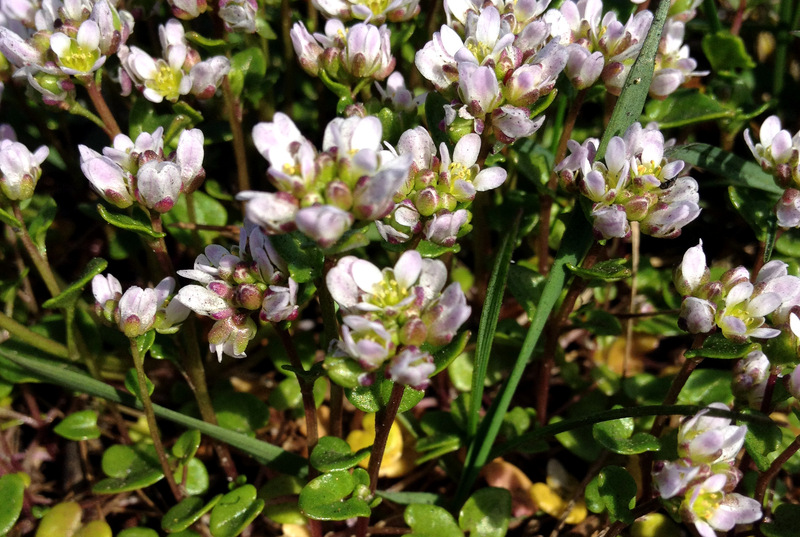 Danish scurvey-grass – Cochlearia danica is one of the fastest spreading species in the UK. The salting and gritting of roads through the winter leads to the burning off of the existing vegetation at the road edges as they cannot tolerate the conditions. This favours this native coastal species which is adapted to higher salt conditions and exploits the new niche which has become available. You might have spotted the drifts of white flowers which can be seen lining many roads, including the central reservation of the A1 where it passes past Grantham. 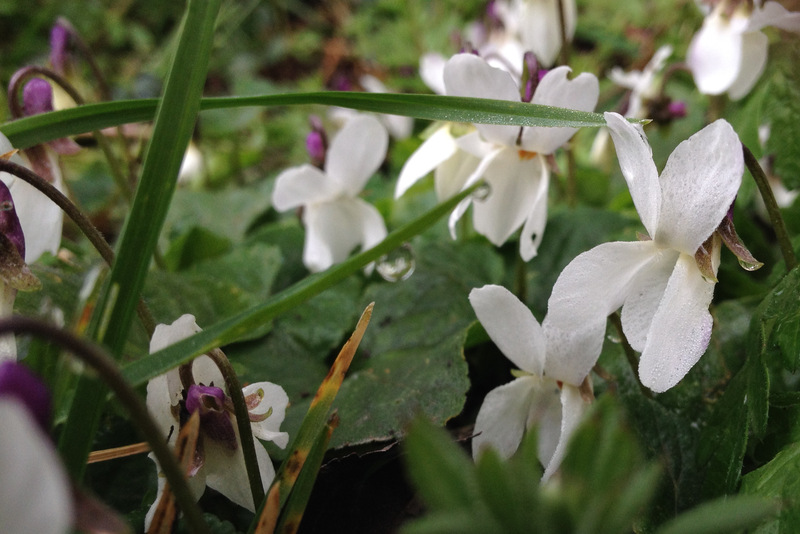 Sweet violet – Viola odorata comes in white or purple and a range of tints in between. These beautiful flowers are robust but small – you need to get quite low to the ground to appreciate them plant. 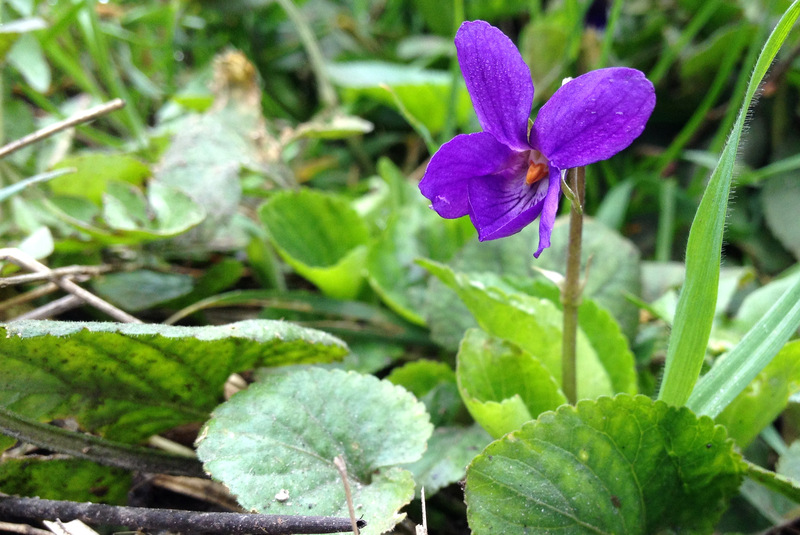 If you get even closer, you can pick up the scent from the flowers – this is the only British violet species which is fragrant. 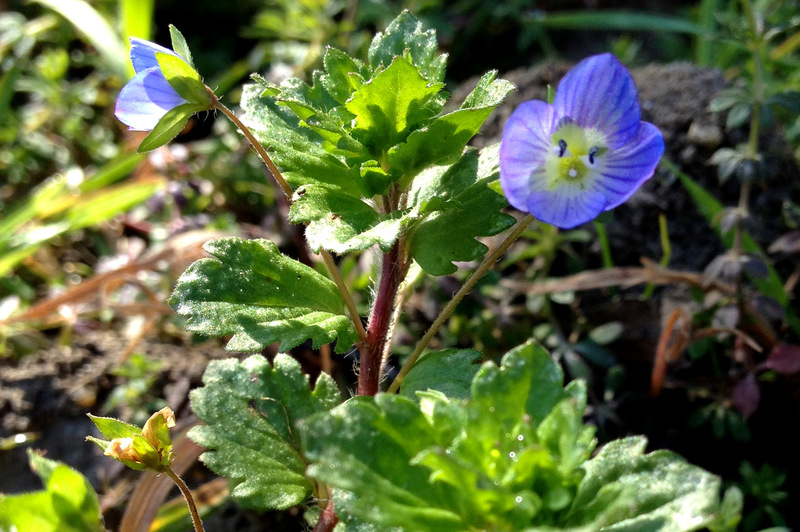 Germander speedwell – Veronica chamaedrys is one of a number of speedwell species which you can find in the UK. It is quite characteristic of the genus with its bright blue flowers and low, creeping habit. These speedwell were abundant along the edges of the arable fields where we were surveying but strayed little into the field itself, perhaps a result of chemical herbicide spraying. 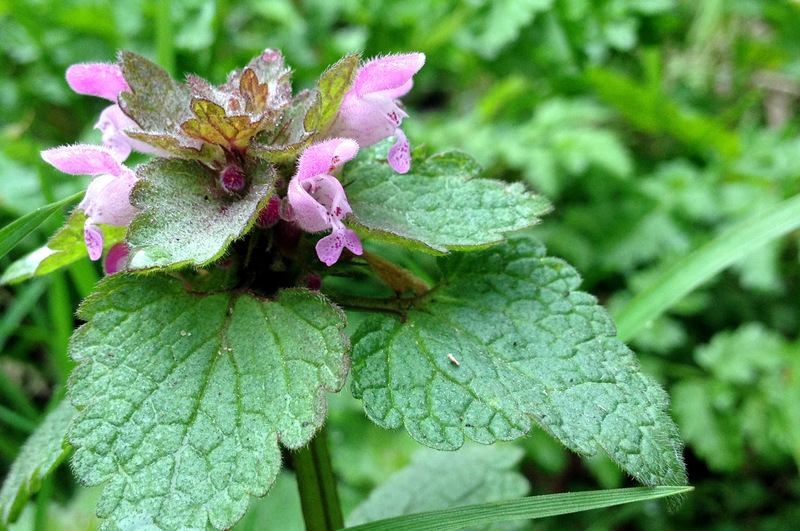 Red deadnettle – Lamium purpureum is one of the early flowering deadnettle species. They are named for their visual similarity to nettles but, as the ‘dead’ suggests, they are not able to sting like the true nettle. The flowers are two-lipped with a distinct upper and lower element. Look out too for the more robust white dead-nettle which is also flowering early in the year. Common dog-violet – Viola riviniana is the commonest violet and can become quite a weed in gardens and on arable land – I know that it is certainly well represented in our garden and it can be spotted around Grantham in a number of places, such as the sunny bank along the road frontage to Grantham College. Like the sweet violet described earlier, it’s necessary to get close to this low, compacy but beautiful species to really appreciate it. Cowslips are a common sight in April and May – brightening up grasslands and motorway verges with their swathes of nodding yellow flower heads. When I first started out in botany, I spent a good while convincing myself that the cowslips were indeed cowslips and not oxlips – Rose’s wildflower key tells you that cowslip is like oxlip but the ‘leaves are more wrinkled and the stem is more gradually tapered to the base’ which requires a certain amount of experience to compare! Luckily the sniff test (cowslip flowers smell like apricots) saw me right! One simple rule of thumb is location – true oxlips are a rare ancient woodland species restricted to the part of the country where the counties of Cambridgeshire, Suffolk and Essex meet. Unless you are in a location like this, you are unlikely to be encountering oxlip. But to be on the safe side, here’s a few more pointers! The flowers of cowslip, like those of oxlip, form a nodding head facing in a single direction. They can be long-stemmed – up to 25cm tall, but are often shorter where the nutrient levels are lower. The flowers are deep yellow with orange flecks in the centre. Cowslip flower at Muston Meadow showing the orange flecks within the flowers – these smell of apricot if you get in close! You can find up to 30 flowers in a flower head, or sometimes just a few. Remember to take a sniff – the apricot aroma is quite distinctive in a fresh flower! Oxlip, as mentioned above, is a rare native found in ancient woodland in a restricted area of the country. If you are encountering the species on a roadside verge or in a meadow in Nottinghamshire, it’s probably not an oxlip. However the species can be bought as a plant, or grown from seed, so it is quite possible it can spring up in unexpected places if it escaped the confines of its sowing! The oxlip is similar in structure and stature to the cowslip, in growing to ~25cm high and having 10-30 flowers on a head. 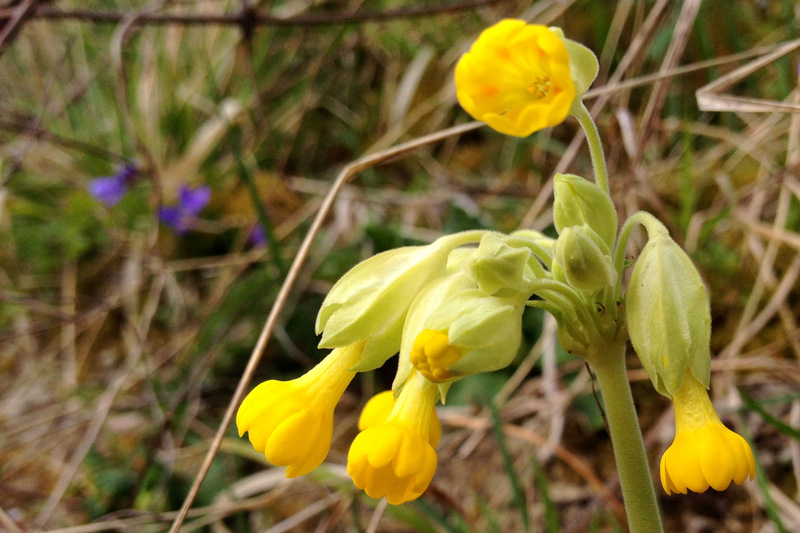 As with the cowslip, all of the flowers will be nodding on the same side of the stem. The oxlip flowers are more open and spreading, lacking the bell-shape of the cowslip. They are generally a paler yellow, and lack the orange flecks inside. The oxlip flower is less bell-shaped than the cowslip, with more open spreading petals and a lighter, paler yellow. The centres of the flowers lack the orange spots usually found with cowslip. False oxlip along the Grantham Canal – the flowers have the orange flecks of the cowslip but spread wider, reflecting the primrose part-parantage of this hybrid. The flowers face in all directions, rather than nodding in a single aspect. Just to add to the confusion, there is another species which can be confused with both cowslip and oxlip and this is the false oxlip. The latin name is Primula vulgaris x veris reflecting the fact that a false oxlip is in fact a cross between a primrose and a cowslip, occuring where these two species are found in close proximity. If you find something which you suspect to be an oxlip outside of the correct habitat and geographical area, a false oxlip is your most likely suspect! The flowers are more open and spreading, a little like an oxlip, but you can see the telltale orange flecks which indicate the cowslip parantage. Rather than nodding in a single direction, as a pure oxlip or cowslip would do, these flowers face in all directions. There is significant variability in the character or these hybrids, with some being closer to the primrose parent and some more strongly representing cowslip.